The warm rays of the sun appeared just in time for university workers and their supporters to take demands for decent income and job security to the streets of Toronto on Saturday, March 21. Over two thousand teaching assistants/graduate assistants, on strike now for three weeks at both York University and U of Toronto, first rallied at Dundas Square, and then walked west on Dundas, north on Spadina, east on College and right up to the front steps of the Ontario Legislature at Queen’s Park. Stubborn, over-paid university administrators share the blame with the Ontario Liberal government for the disruption of classes at Canada’s two largest post-secondary institutions. Premier Kathleen Wynne’s Liberal regime is guilty of grossly underfunding universities, prompting school head honchos to put more and more of the teaching burden on a poorly paid, precariously-employed, academic work force. 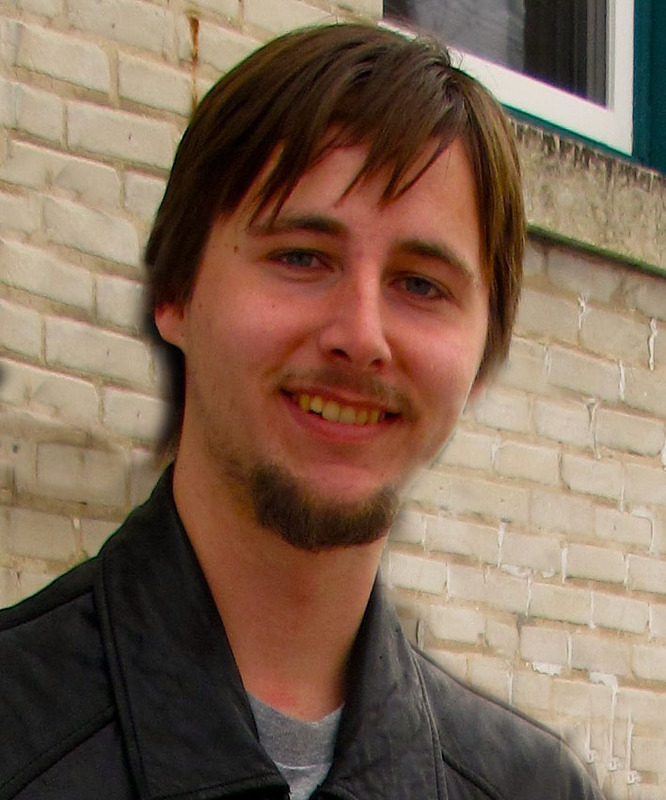 I am a student, labour activist and have been a resident of Mississauga for 24 years. My family has a long history of learning at, and working for the Peel District School Board. I care deeply about our public school system. From the fight against Bill 160 in the Conservative Mike Harris years, to the most recent dispute with the McGuinty/Wynne Liberal government, I have walked the picket line with teachers, defending their right to decent wages and collective bargaining. As a student, I have taken part in demonstrations in Ontario and Quebec in favour of free, quality post-secondary education for everyone. This municipal election is full of liberals, conservatives, and other candidates who have no plans to change the status quo, or to make Mississauga a better place in which to live. With land development firms making bigger campaign contributions than any other entity – while public services shrink — it’s clear who’s calling the shots and who’s getting left behind. The school trustee races are particularly lacking in policy platforms. Most candidates seem content to run on vague slogans and platitudes, rather than advance clear ideas, let alone good ones. This is why it is time for a change. We need real working class candidates to stand up for our public services and to offer a bold direction, to fight for radical change, to ensure that everyone is guaranteed free and equal access to quality public services. For free secular public education, with one school system in English, and one in French. No public funding for religious, separate or private schools. End standardized testing. End streaming of students into dead-end courses. No cutbacks. No school closures. For free collective bargaining for all education workers. For decent pay, benefits and job security for teachers, substitute teachers, hall monitors, lunch room attendants and school office staff. Elimination of property tax on primary residences. For steeply progressive taxation of land developers, big corporations and banks, religious institutions and the rich. A new needs-based funding formula to cover the real costs of public education. Smaller class sizes in every grade; more teachers and support staff. Give students a greater range of subjects and make improvements in culture, arts, music, sports and environmental studies. 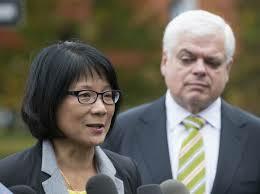 Increasing funding for Adult Education and English as a Second Language (ESL) program’s. Voting rights in civic elections for permanent residents. 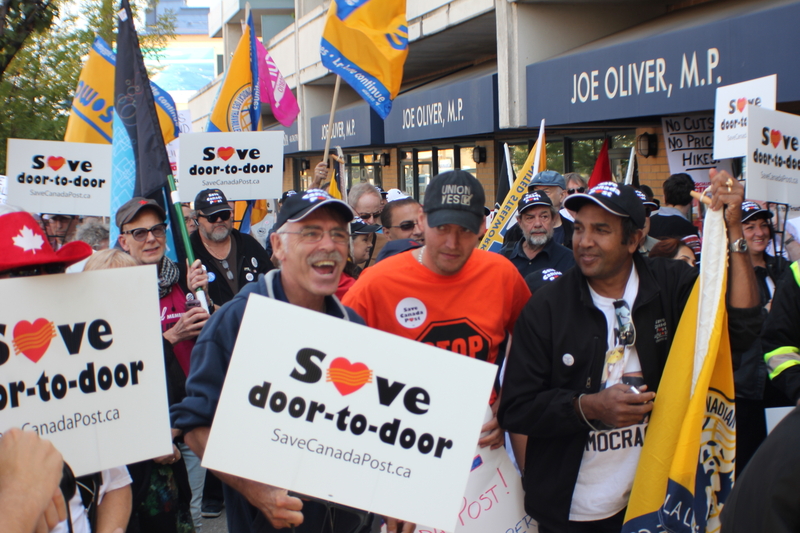 Over 400 people rallied on Saturday, September 20 outside the uptown Toronto constituency office of Conservative Finance Minister Joe Oliver to demand a halt to Tory and Canada Post Corporation plans to eliminate home mail delivery and set higher prices for postage. Participants came from as far away as Vernon, B.C. and Charlottetown, P.E.I. They included retired auto workers from Oshawa, and a group of posties who hired a bus in Hamilton, Ontario. Rally chair Elizabeth Byce, a proud retired member of the Canadian Union of Postal Workers, past Secretary of the Toronto and York Region Labour Council and a leading member of Socialist Action, welcomed the crowd. 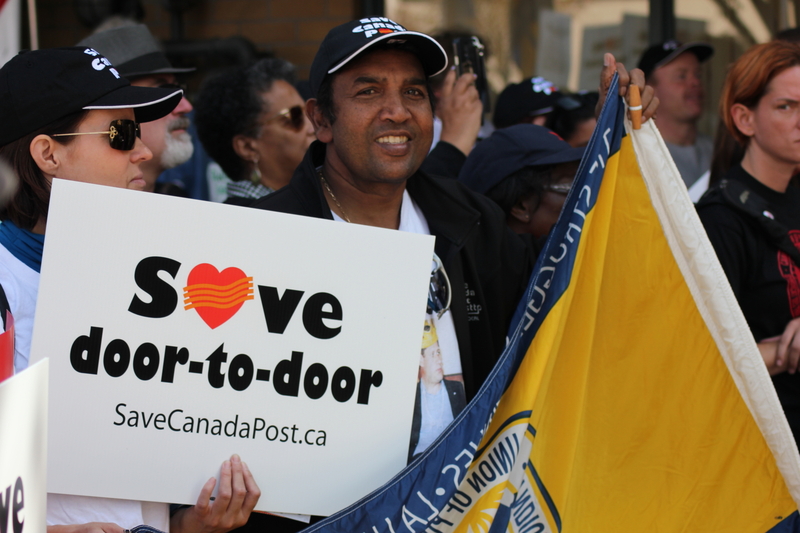 In the breezy, warm sunshine she led-off the proceedings with a few chants: “1,2,3,4, mail delivery door-to-door, 5,6,7,8, stop increasing postal rates”, “Stop the Cuts at Canada Post”, and “They say Cutback. We say Fightback”. 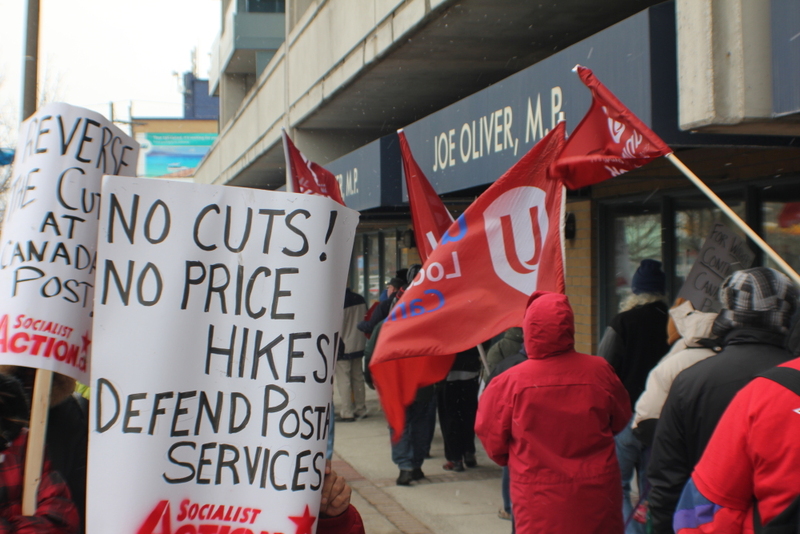 “I say to Finance Minister Joe Oliver, you can hide, but you cannot escape our anger, and you cannot avoid our determination to hold you and your government accountable for cuts to the postal service that Canadians hold dear. Keep your bloody hands off our public services!”, Byce told the gathering. “Denis Lemelin, the leader of the fight to save vital postal services and good jobs, is the President of the Canadian Union of Postal Workers. His involvement in the union began in 1979 when he started as a postal clerk in Sherbrooke, Quebec. 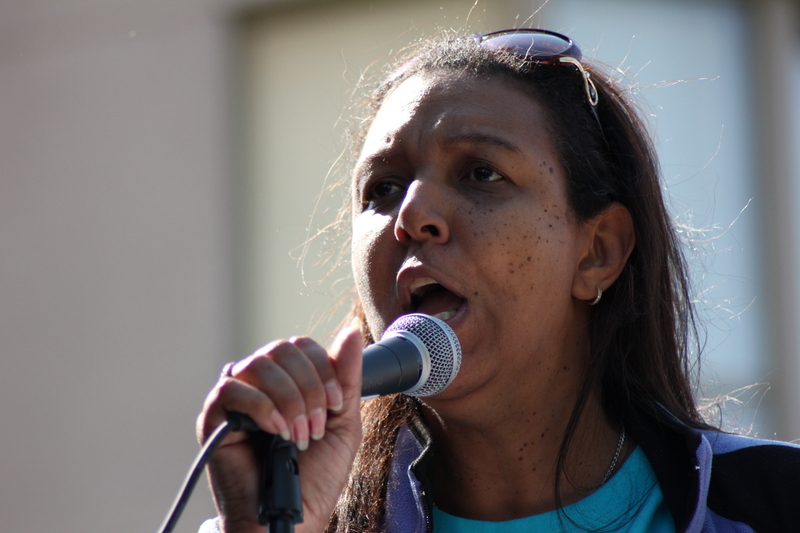 “Marie Clark-Walker comes out of CUPE-Ontario. She celebrates her Jamaican heritage, and is a Vice President of the Canadian Labour Congress. “Sid Ryan, President of the Ontario Federation of Labour, is a past-President of CUPE-Ontario, and is former Ontario Tory Leader Tim Hudak’s worst enemy. “Sharon DeSoussa is the Regional Executive Vice-President in Ontario for the Public Service Alliance of Canada. 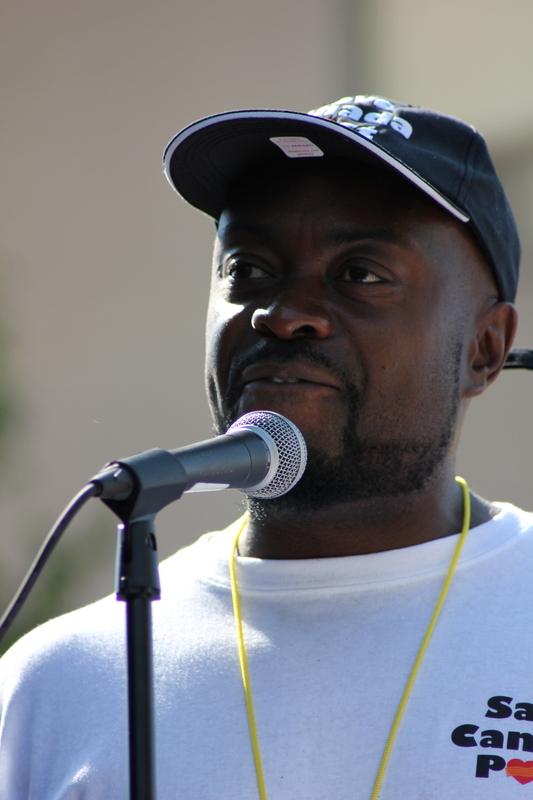 “Mark Brown is the Education and Organizing Officer for the Metro Toronto Region of CUPW, and is also a member of the Coalition of Black Trade Unionists. “Hockey has its Hall of Fame, and so does Labour. Buzz Hargrove is a past President of the Canadian Auto Workers. He speaks today on behalf of Unifor, Canada’s newest and biggest private sector union. 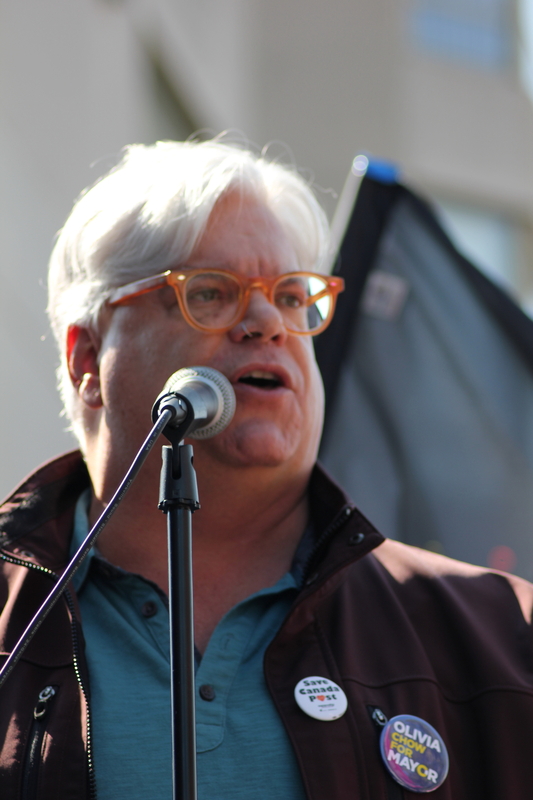 “The Ontario Public Service Employees’ Union, which generously contributed to the publicity tools that made this rally a success, is represented by a Vice President of OPSEU, Myles Magner. 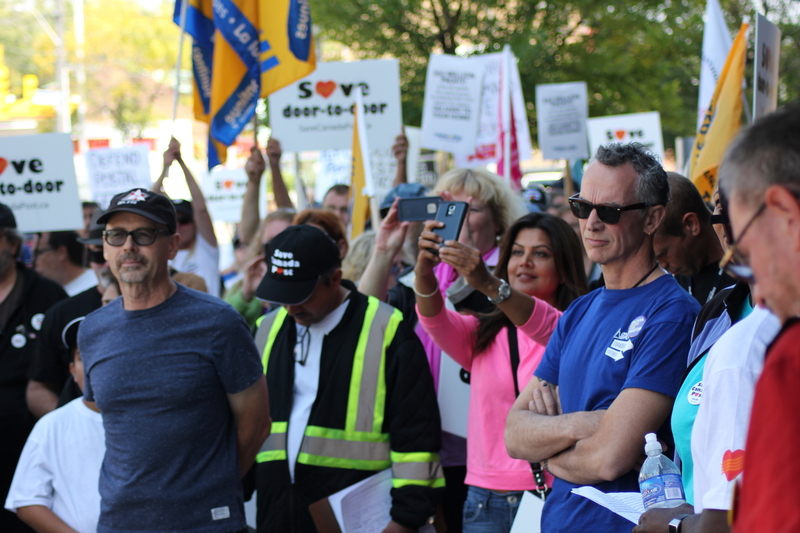 “The Canadian Union of Public Employees in Ontario played a key role in promoting the protest. 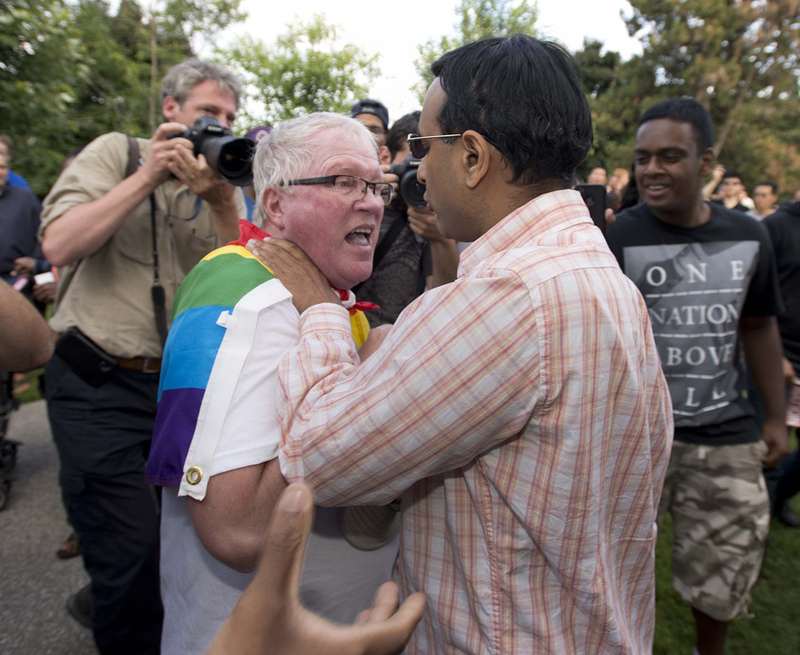 Fred Hahn is the President of CUPE-Ontario, and a long-time fighter for LGBT rights and dignity. “Liz Rowley is the Ontario leader of the Communist Party and a former school board trustee. 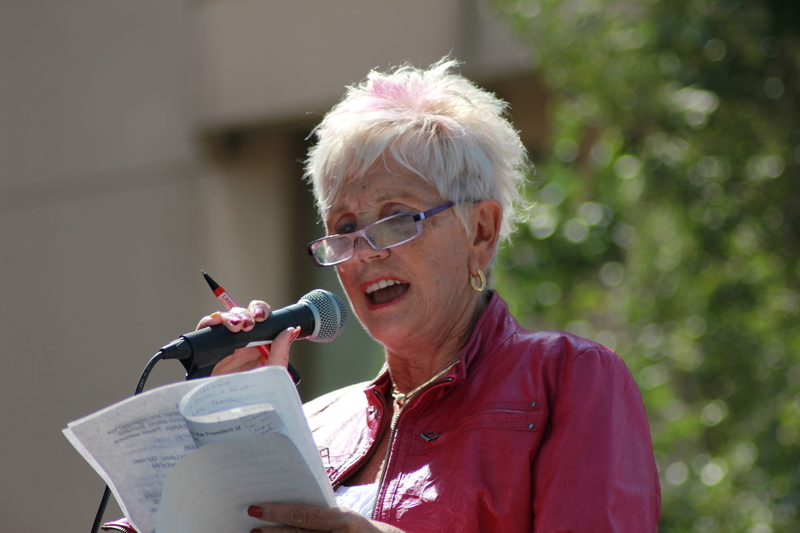 “Carolyn Egan is President of the United Steetworkers’ Toronto Area Council and a member of the Toronto and York Region Labour Council executive. 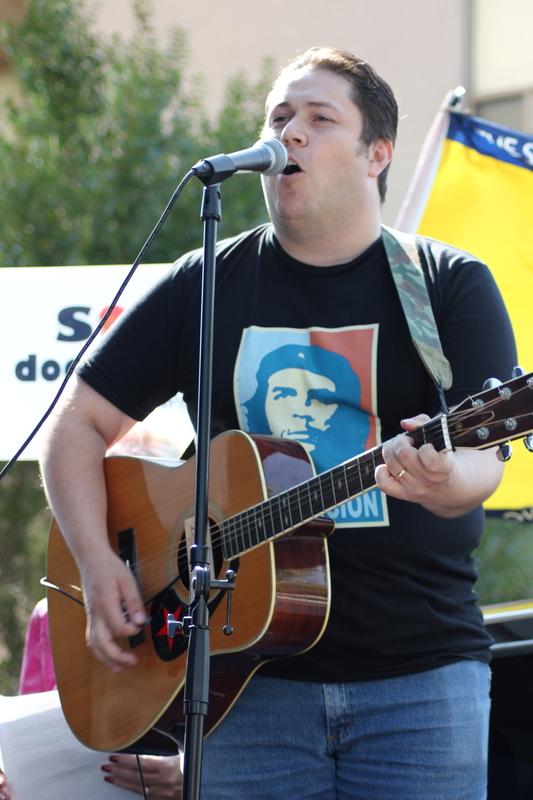 “Chris Clay is a leader of CUPW in Charlottetown, Prince Edward Island. 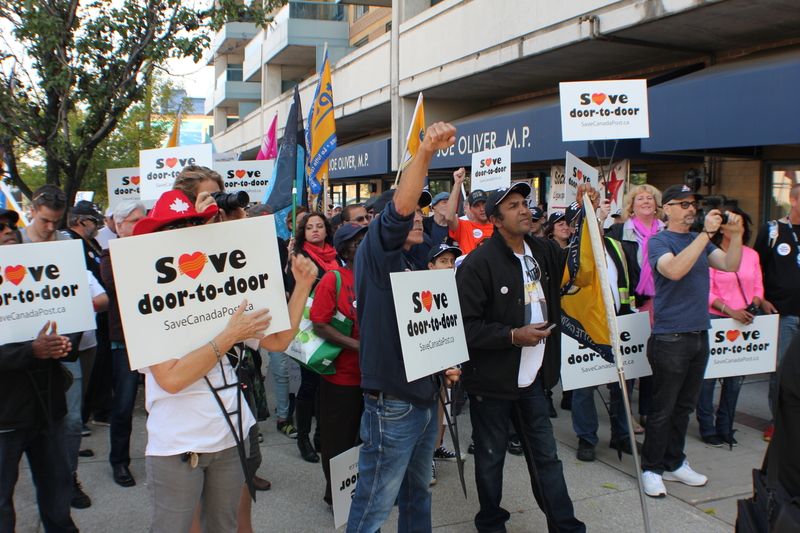 The rally chair reminded everyone that the campaign to Save Canada Post continues, and called on people to attend a meeting of the Toronto Organizing Committee to plan the next steps. Extensive coverage of the Toronto protest featured prominently on that day’s 6 p.m. and 11 p.m. news broadcast of CITY-TV. “Sisters and brothers, it’s great to see such a large crowd here on this beautiful day. Did you enjoy the summer? I did. I spent much of it organizing this rally, and I’d like to tell you why. “Firstly, I’m sick and tired of Tory lies. Canada Post is profitable. And it could be even more profitable if we had postal banking. We need good jobs. Killing over 8,000 letter carrier jobs makes no sense — unless you are a corporate vulture planning to dine on the dismembered parts of a vital public service. leave for its members, a gain that spread to all organized workers. 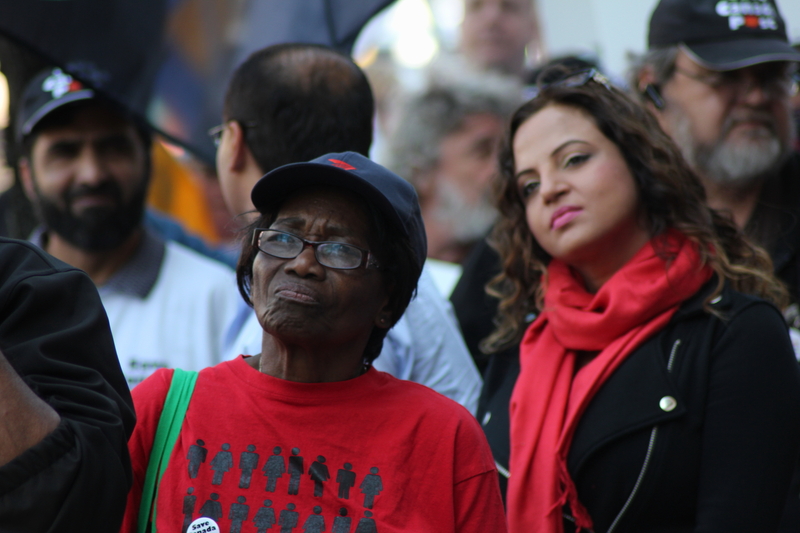 CUPW has been in the forefront of solidarity campaigns with workers’ struggles, at home and abroad, for generations. That’s why it has legions of allies. Now is the time to returnthat solidarity, and to stopthe onslaught against public services and workers’ rights. It is also a golden opportunity to boot the Harper Conservatives from office, and to bust up the bosses’ offensive. “That brings me to the third reason. We can win this issue. How do I know? Look at the doctor’s note fiasco. Deepak Chopra made that brainless suggestion because he and Harper are on the defensive. “They’re feeling the pressure. The plan to terminate home mail delivery is possibly the most unpopular policy of the Tory government. But it’s tied to many others. Like undermining pensions and E.I. Gutting health and safety in the work place. Promoting dirty oil pipelines. Plundering aboriginal lands. Victimizing migrant workers. Sending troops to Iraq. Backing the seige of Gaza. Giving tax breaks to big corporations. Watching our cities descend into the despair of grid-lock and homelessness. “We in Socialist Action believe that the common denominator of global social misery is the destructive and dying capitalist disorder. There’s a funny saying: “Capitalism is just a phase we’re going through.” Unfortunately, this phase is killing the planet and its inhabitants. Its stale date is well over a century old. We need ways to break the grip of the 0.1%. 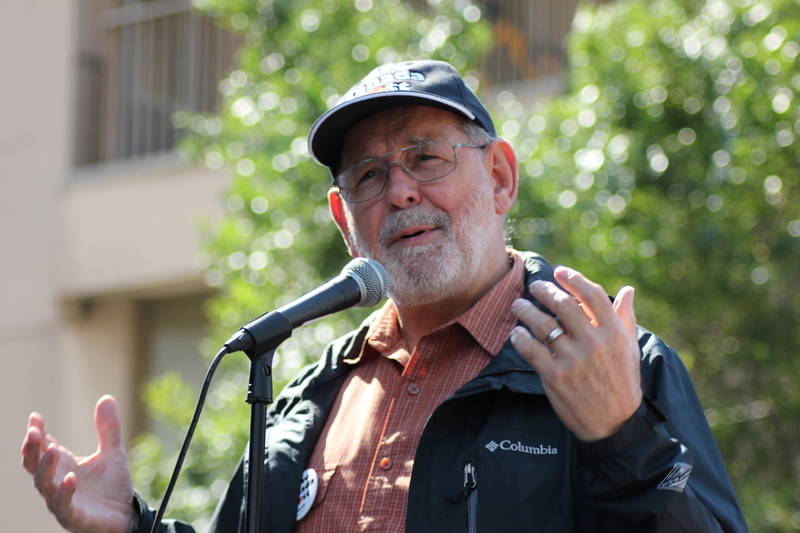 “The fight to keep our valued postal services, is just such a way. This issue is Harper’s achilles heel. If, together, we can drive this campaign forward, there’s no telling what we can achieve. 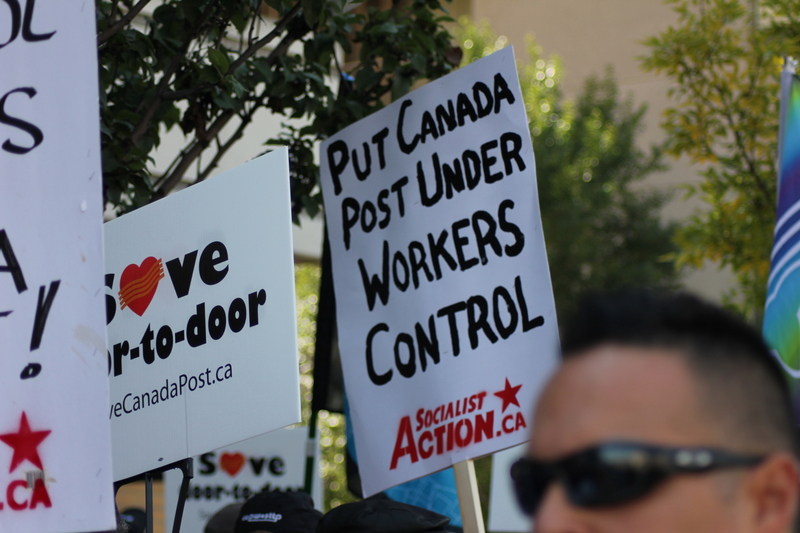 Momentum is growing towards a monster mass picket and rally to defend Canada’s postal services. 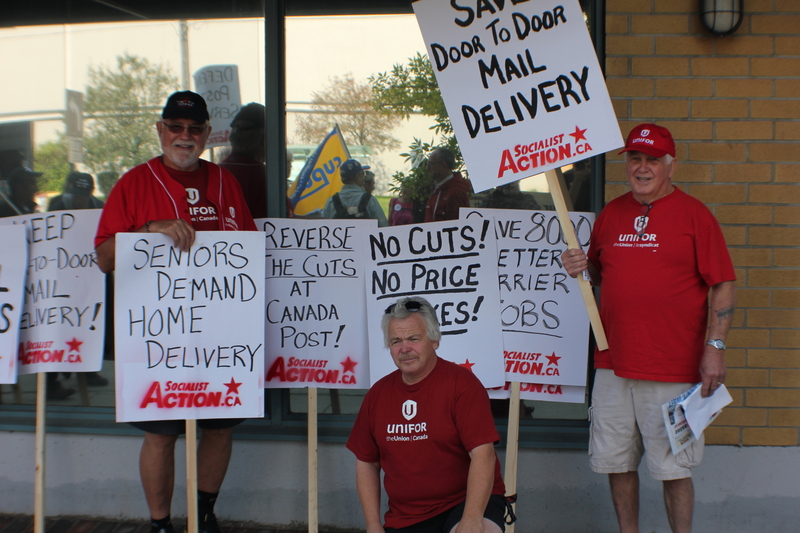 The protest, set for Saturday, September 20, is against Canada Post Corporation plans to terminate home mail delivery. It will be held outside the Toronto constituency office of Conservative Federal Finance Minister Joe Oliver at 511 Lawrence Avenue West. Organizations endorsing the September 20 mass picket now include the Canadian Labour Congress, Ontario Federation of Labour, Canadian Union of Postal Workers, Ontario Public Service Employees’ Union, Public Service Alliance of Canada-Ontario, Coalition of Black Trade Unionists, Brampton and Mississauga District Labour Council, CUPE Local 3903, Ontario Coalition Against Poverty, NDP Socialist Caucus, Communist Party of Canada, International Socialists, and Socialist Action / Ligue pour l’Action socialiste. Socialist Action/LAS initiated this effort, on the heels of a successful picket it convened on a very cold March 15 at the same site. 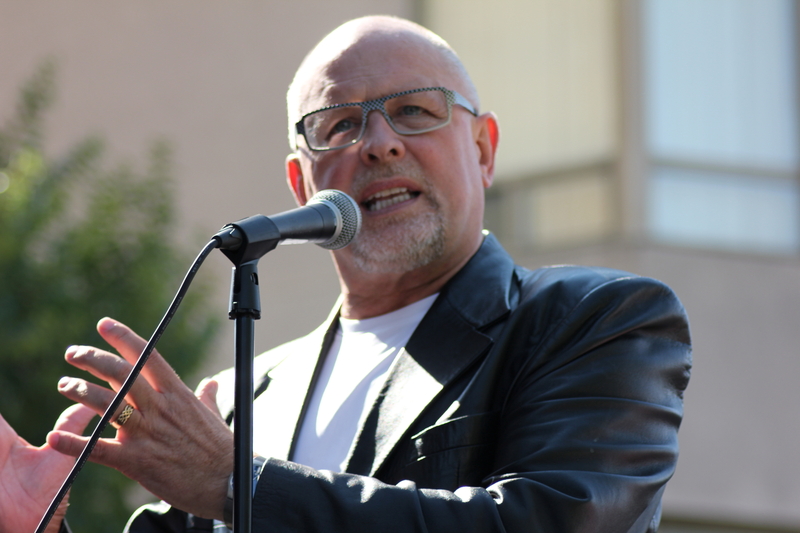 The September 20 speakers’ list now includes CUPW National President Denis Lemelin, CLC V.P. Marie Clarke Walker, OFL President Sid Ryan, OPSEU President Smokey Thomas, a leader of PSAC-Ontario (t.b.a. ), and representatives of other endorsing organizations. raise the price of postage. The scheme to degrade postal services, to alienate the public towards them, serves the goal of gutting the federal public sector. Within that framework, the rulers strive to trash good jobs, slash postal workers’ pensions, and to break a progressive, democratic union. 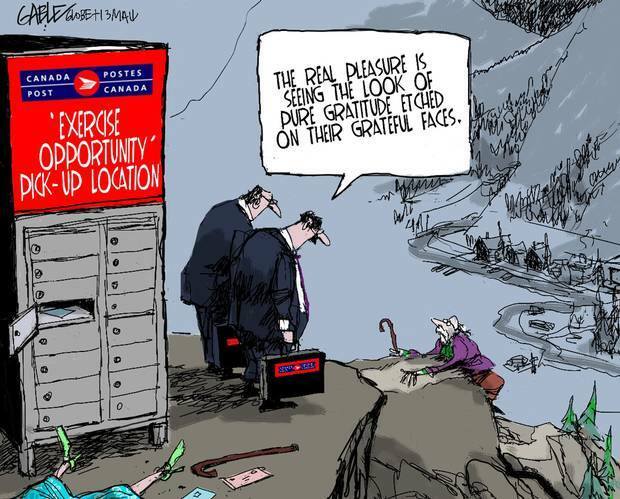 It is a road that leads to selling the most profitable parts of Canada Post to private sector vultures. This brazenly broad assault must be stopped. 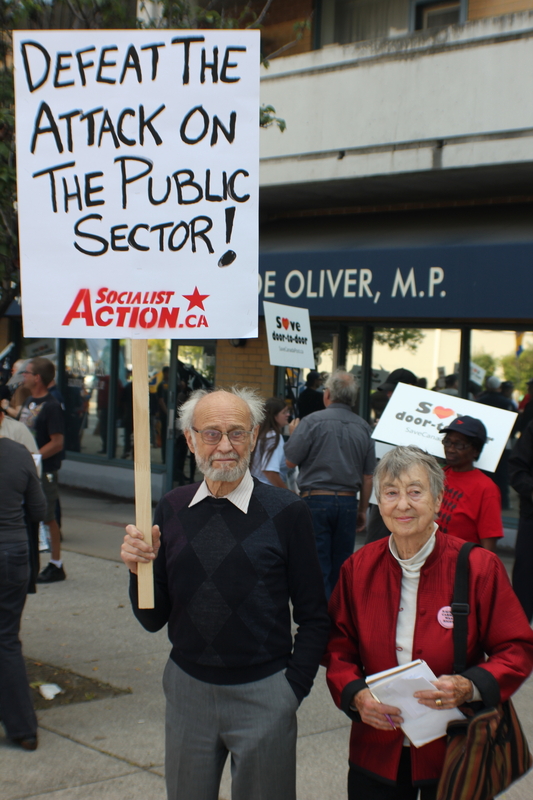 It is a watershed moment for public services and for the workers’ movement across the Canadian state. The need for public resistance is urgent. Protest activity is developing across the country, with rallies, pickets and town hall meetings. Many municipal governments, including Toronto’s City Council, have voted to oppose the replacement of home mail delivery with collective mega-mail boxes. September 20 is part of that resistance. 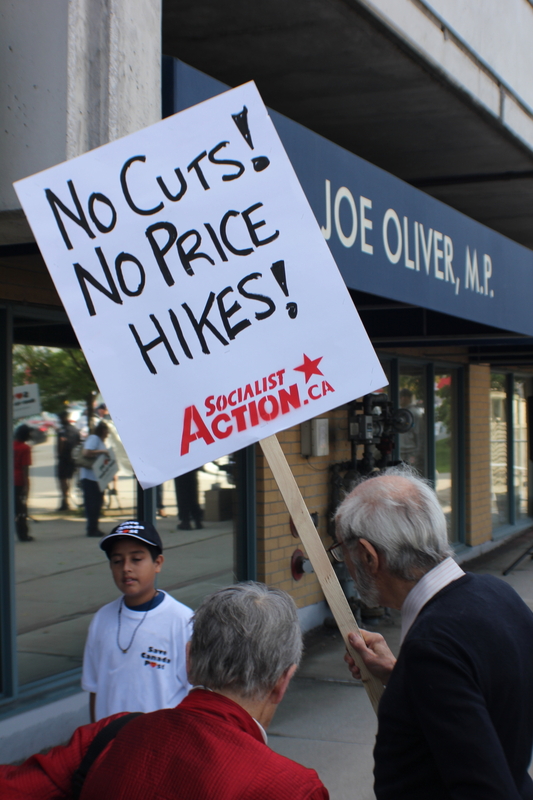 The message to Eglinton-Lawrence MP Joe Oliver, the Tory Minister of Finance, is that his Conservative federal budget which aims to slash jobs and kill vital public services, while pampering the corporate elite, is unacceptable. Joe Oliver voted in Parliament against the New Democratic Party motion to maintain door-to-door mail delivery. Seniors and people with mobility problems strongly oppose being forced to collect their mail at a so-called ‘community mail box’, blocks from home, under all kinds of weather conditions. The resulting elimination of up to 8,000 letter carrier jobs would be a serious blow to young people and to many others seeking decent-paying employment in a time of great economic stress. Canada Post is not in debt. And it could be even more profitable as a public asset if it provided banking services at postal outlets across the country. Canada Post and the Tory government suppressed a study that shows how providing banking and other services is the way forward. To the consternation of the vast majority of Canadians, the Tories are stealing workers’ pensions, while cutting jobs and services. If this is the best that the Harper Conservatives have to offer, then they must go. If this is the best that capitalism has to offer, then it too must go. If Canada Post CEO Deepak Chopra, and Prime Minister Stephen Harper cannot run a postal service to meet human needs, they should step aside. Let postal workers show you how to run the service – under workers’ control. 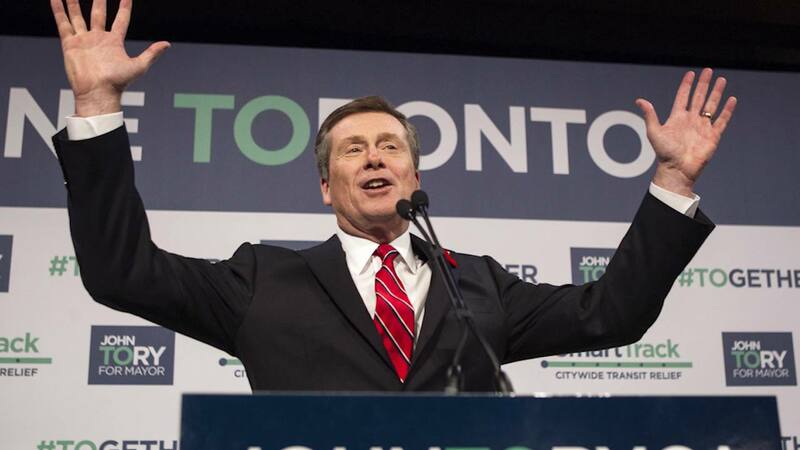 Take notice Deepak Chopra, Joe Oliver and Stephen Harper: This fight has just begun. Across the country you are facing a rising torrent of opposition to the placement of mega-mail boxes in every city and town. We will not stop fighting your cuts until we reverse them. We will not stop until we remove you.